2nd Bn, The Worcestershire Regiment, 100th Brigade, 30th Division, B.E.F. William Houghton, who joined the 8th Worcestershire Regiment, lived at Chapel Cottage, North Malvern Road with his parents. He joined the Territorial Force in January 1913 at the age of 17 – a member of the Malvern Detachment of ‘C’ Company. He landed in France with the ‘B’ Company, 1/8th Battalion on 1st April 1915 and served with them at Ploegsteert where, on 28th May 1915 he was wounded. The trenches were particularly close together in this sector and a number of casualties were caused by rifle grenades and snipers. His wounds cannot have been serious as he returned to the unit four days later. The Battalion moved to the Hebuterne sector on the Somme in autumn 1915 and served here until the middle of the Battle of the Somme. On 20th July 1916 they were repairing a section of the Pozieres road when they were shelled by a new type of gas shell which went undetected. William Houghton along with over 500 of his comrades were affected. Within a few hours men were collapsing and in the end had to be taken out of the line to convalesce. Most men did not return until December 1916 – William returned on 8th December. His time with the battalion would be short-lived however. On 14th December 1916, the 1/8th Worcestershire Regiment were once again holding trenches around Le Sars, on the north side of the Albert – Bapaume Road. During the day the War Diary recorded the front line and support trenches were subjected to the “usual shelling.” One “5.9” howitzer shell landed directly in a post held by ‘B’ Company men and killed seven men instantly. One subsequently died of his wounds. 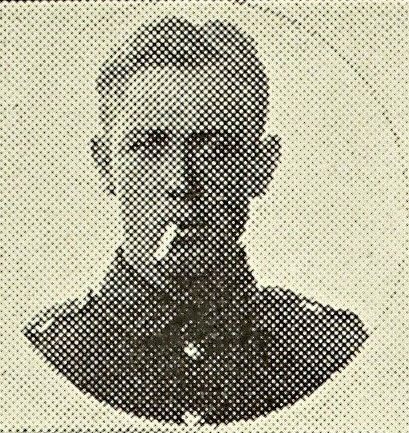 Three men, including William Houghton, from ‘B’ Company were wounded. This time his wounds were more serious and he was transferred to England for further treatment and recovery three days later. Later in the year, he was fit enough to be posted to France again, but this time joined the 2nd Worcestershire Regiment. In September 1917 they were involved in fighting as part of the Third Battle of Ypres. On 26th and 27th September the battalion was fighting near Gheluvelt at Polygon Wood and took part in an attack the recaptured ground lost to a German counter-attack some days before. However during this fighting, William Houghton was killed in action. His body was never identified after the war and he is commemorated on the Tyne Cot Memorial.